The Wasteland is an exciting place, full of possibility. Between exploring, questing, and looting in Fallout: The Board Game, it’s hard to imagine there’ll be time for anything else, but you’re not the only one trying to survive out there. In your wanderings, you’ll encounter all kinds of tough and aggressive enemies, and we’re here to help prepare you to meet them and beat them! Plenty of enemies are perfectly content to keep to themselves unless you really get in their way, but not these guys. Enemies with an Aggressive icon will attack anyone who crosses their path without hesitation, so don’t plan on sprinting past them without a backwards look. Spoiler alert: it won’t work. And some of these enemies are really scary. Common Examples: Radscorpions, Raider Psychos, Deathclaws. Joining the camp of way-too-excited-about-being-shot-at are those who have adapted to the sprawling post-nuclear landscape and feature a long-range attack. A Ranged symbol indicates an enemy who can not only attack from a space away but who will do extra damage if you’re unable to respond in kind with your very own ranged weapon. That just means you might consider picking up a gun in your spare time. Common Examples: Bloatflies, Mr. Gutsys, and Super Mutant Skirmishers. There’s something exceedingly satisfying about almost taking damage, but rebuffing the attack with highly effective armor. Less satisfying, however, is facing an enemy who has the same idea. 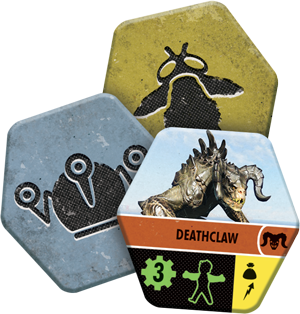 Some of your combat opponents, featuring a Armor icon, will come with an extra layer of damage resistance, making them way more irritating to defeat than other creatures of the same level. Common Examples: Raider Scum, Protectron Medics, Yao Guais. While most of our foes will be annoyingly persistent, some will cut you a little slack when they know you’re having a tough day. Once they’ve done a little damage or evaded enough of your poorly aimed shots, enemies featuring the Retreat symbol will politely wander off, waiting for some other unsuspecting wastelander to mosey on through. Common Examples: Mole Rats, Radscropions, Looters. Speaking of looters, there are some adversaries you’ll encounter who will actually reward you for your efforts. Kind of. Any enemy you successfully finish off featuring a Loot icon will allow you to draw one card from the loot deck! Though the items you pull off of your opponents won’t be the shiniest, you may find some valuable stuff, like companions, Chems, Caps, or low-level combat equipment. Common Examples: Raiders, Super Mutants, Protectron Medics. The final trait to look out for is one this post-nuclear world has well prepared you for. If your rival has a Radiation symbol, not only will their hits strip you of HP, you'll also take radiation from the fight! Bummer if you’re a mere human, but a boon if you’ve chosen to take on the wasteland as a ghoul or super mutant! Common Examples: Radroaches, Feral Ghouls, Glowing Ones. We know that's a lot to keep track of, so we've put together a handy dandy graphic that you can load into your Pip-Boy to help you remember! Now that you know what you’re up against, let’s take a look at the combat itself. On your survivor board, you have three pegs: red for HP, green for Rads, and gray for XP. Fighting enemies in the game is one of the main ways to move all three of these pegs along their respective tracks—though that’s not always going to be a good thing. Fight actions in the game are all driven by a simple roll of the three V.A.T.S. dice, which feature two things: targeted areas and icons, or Hits. Each enemy you face will have vulnerable areas, and you can only hit them by targeting those areas. For every die face that shows an area of the body matching your enemy’s vulnerabilities, you inflict one hit on them. Yay, you! However, you need to watch out, because every hit icon showing is equal to damage times the enemy’s level. 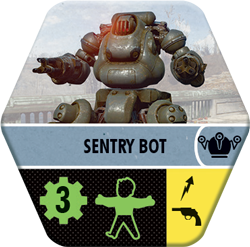 So if you’re facing a scary, level three Sentry Bot and five hits are showing, you’re going to take fifteen damage, moving your HP peg down fifteen spots! Those of you who are good at math know that means you’re almost certainly going to be killed. It’s a harsh reality. Now, being killed isn’t actually the worst thing in the world. All you have to do is move back to the starting tile and lose everything in your inventory. We're not saying it’s a walk in the park or anything… but it could be worth taking a risk if there’s a worthwhile reward on the line. Plus, it’ll be funny to watch for your fellow survivors. What’s the point of all this, you may ask? Experience points! Winning fights is the very best way to gain a whole lot of XP, and thus, new skills or perks. Whenever you successfully kill an enemy, you gain XP equal to their level, meaning that the more dangerous the enemy, the better the reward. What SHOULD You Bring to a Knife Fight? While getting XP is exciting and fun, taking damage is notably less so. Fortunately, there are ways to increase your damage, should you miss your enemy’s soft spots, and mitigate the damage you take, if you’re dealt far more damage than you were hoping for. Your ability to change the results of a fight is all dependent on the items, companions, and traits you’ve collected throughout the game. Most often, you’ll be able to take a shot at better results by rerolling dice. Weapons let you do this if you know how to use them properly, so it's advantageous to equip a weapon that’s well suited for your survivor’s developed S.P.E.C.I.A.L. skills. 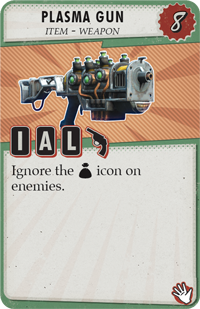 For example, if your survivor has the Intelligence skill and uses the Alien Blaster—which features two Intelligence icons — you get not just one, but two rerolls of as many dice as you choose! It also pays to take a break every now and again. Whenever you take the Rest action, you get a Well-Rested token, which can be discarded for a die reroll during any Fight or Test. There are some abilities associated with weapons, armor, and companions that will adjust the results of your dice as well. The special properties of these items can change your die rolls by adding hits, blocking damage, increasing your number of hits, or influencing the icons your enemy possesses. Often this will help you, but some weapons do have a disadvantage to consider. For example, the Plasma Gun offers range and up to three rerolls—but when you dissolve your enemies to a puddle of goo, the loot you could’ve grabbed dissolves with them. It's just about time to put on some armor, grab your best gun, and get out there. Welcome to the Wasteland. 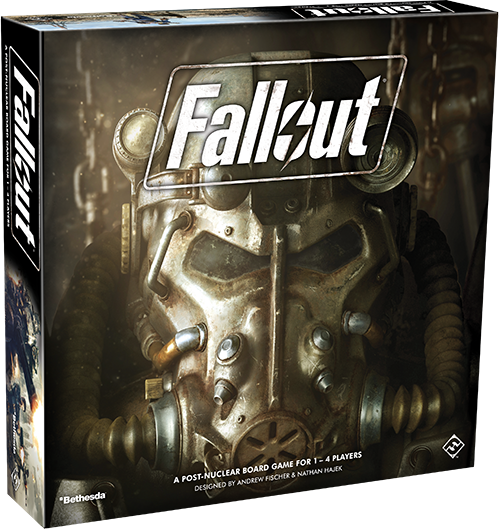 Look for Fallout (ZX02) will be available at your local game store on November 30th! Pre-order at your retailer or online through our website today!